Some parts of the west are under strict water conservation rules to help cope with a continuing drought. Even if there is no drought where you live, wasting water is bad for the environment. And it ends up wasting your money, too. Don’t run the dishwasher or the washing machine unless you have a full load. Don’t rinse dishes individually. Instead, put them in the drainer and rinse them all at once with a pot of water or the sink sprayer. Don’t run your garbage disposal excessively. Consider composting as much garbage as possible. Use water-saving shower heads and toilets. Use food coloring to check your toilet for leaks. Put a few drops in the tank; if colored water appears in the bowl within half an hour, you have a leak. Don’t water in the heat of the day or on windy days. When you do water, soak the lawn thoroughly. That promotes deeper roots, which makes your lawn healthier and more resistant to drying out. Don’t cut your grass too short; that makes it dry out more quickly. Plant grass that is appropriate for the amount of rain you typically get. If you live in a desert climate, don’t plant grass at all. Instead, landscape with rocks and desert plants. Use plants that are appropriate for your climate. 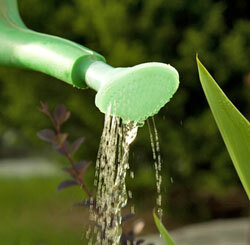 Use a drip system rather than a sprinkler to water gardens, shrubs and trees. Put mulch around the base of trees and in the garden to guard against evaporation of water. Sweep your sidewalk and driveway rather than hosing them off. When you wash your car, wet the car down and then turn off the hose while you soap. Turn it back on for rinsing.